This bundle contains 3 of my Dolch products! 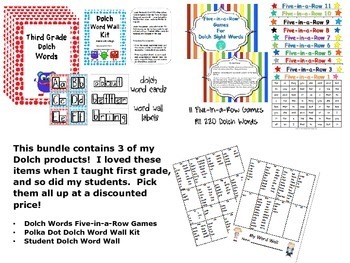 I loved these items when I taught first grade, and so did my students. Pick them all up at a discounted price! This set Five-in-a-Row games is a fantastic way for students to practice reading their basic sight words. There is a game board for each of the 11 lists. Create a quick and easy center or activity for an independent time. Just print and laminate for a durable set of games! I used the lovely font FSFLettersinBox, from Graphics from the Pond, to make this great word wall! I have looked for this font for years and was thrilled to find it!!! Inside this packet, you will find all 220 Dolch words, sorted by list, ready to cut out and put up! Themed letter cards for headings are included at the end. This word wall is perfect for student writing folders. It contains the 220 Dolch words in a chart form. Print it double-sided on cardstock and laminate or place in a page protector for student use.